During the years following World War II, an outfielder who posted batting averages of .380 and .368 in the minor leagues should have found little trouble getting a starting role in the Major Leagues. That is of course unless you played for the Red Sox and two of those outfielders were Ted Williams and Dom DiMaggio. 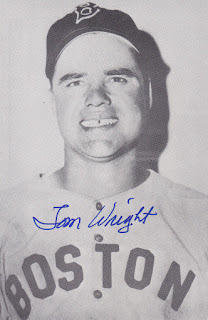 This was the tough reality for Tom Wright, one of North Carolina’s finest, who filled the role of pinch hitter extraordinaire for the Boston Red Sox right at the start of the 1950s. Wright, who went on to play parts of nine big league seasons, passed away on September 5, 2017 at his home in Shelby, North Carolina. He was 93. Growing up on the sandlots of Shelby, Wright caught the attention of Boston Red Sox scout Eddie Montague, who signed him to his first pro contract in 1941 while he was still in high school. Wright left behind the opportunity to get his diploma in order to start his career. Fortunately for Wright, his release didn’t put a premature end to his career, as he signed on with Boston’s team in the Class D Bi-State League in 1942. While he wavered at the plate, his manager noted his good arm and gave him a few chances on the mound, albeit with mixed results. Just as Wright was trying to figure out if his baseball career would continue in as a position player or a pitcher, he was drafted for military service after the season ended. For the near future his career would be navigated by the Army Air Corps. His time in the Air Corps was short lived. He sustained an injury during training that dissuaded him from continuing to fly. “In the service I was supposed to an aerial gunner,” he said. “I had to bail out of one, and on an emergency jump, I tore my leg and my foot up. I stayed out in Wyoming for a year before they ever put me back on flying status. By that time, I made up my mind I wasn't going to fly anymore, just be on the ground crew. His switch to the grounds crew proved to be a life altering decision. While Wright was lucky enough to return from service with some injuries that plagued him throughout his baseball career, many from his original Air Corps crew didn’t come back at all. Wright returned to professional baseball in 1946 and after three years of only playing recreationally during his World War II service, he jumped right back into the game. The time away from the field took a toll on his throwing arm. If Boston’s brass was aware of Wright’s arm injury, it sure didn’t show at the plate. Wright’s 1946 season was nothing short of amazing. He amassed 200 hits en route to a .380 average for Class C Durham Bulls in the Carolina League. It was the start of his rapid ascent to the major leagues. After batting over .300 for the next two seasons in the minor leagues, the Red Sox called up Wright for a cup of coffee at the end of 1948, a move he thought came too late. With veterans Williams, DiMaggio, and Al Zarilla firmly entrenched in Boston’s outfield, Wright remained at Louisville, where won the 1949 American Association batting title, edging out future Hall of Famer Ray Dandridge, .368 to .362. 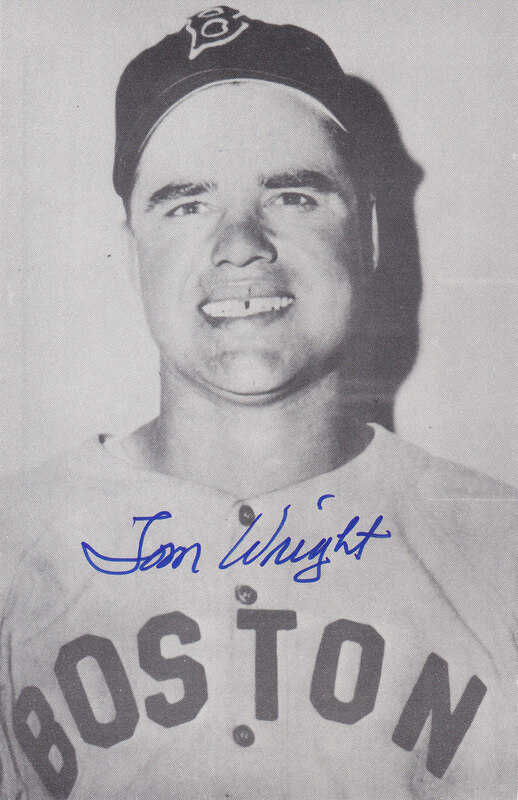 For Wright’s efforts, he was awarded another September call up, and in 1950, he finally got a full-time shot with the club, spending the entire season with the Red Sox. He proved valuable as a pinch-hitter, filling that role until Williams injured his elbow. Pressed into more regular duty, Wright hit .318 in 107 at-bats. He explained just how difficult it was to stay sharp with the platoon situation that the Red Sox employed. “It didn't bother me because it was my job,” he said. “It was the only time I'd get to play most times. I'd go 2-3 weeks and not even get to hit. They ran a funny schedule. You would go on the road and the regulars got all the batting time. I was a left-handed hitter. If there was a right-handed pitcher starting against us, I'd get three swings in batting practice. If there was a left-hander which they pitched on the account of Williams and a few other left-handed hitters, we didn't get to swing. Despite Wright’s dependability as a pinch-hitter, the Red Sox had plenty of young outfield talent in their minor league system and wanted to shuttle Wright between the minor and the major leagues. After proving himself with multiple .300 seasons at both levels, he finally put his foot down. “I started with Boston until the last spring training day,” he said. “They sent me out and they had a boy Karl Olson they wanted to see, because I think he had to go into the service and I was the one that had to go and make room for him on the roster. The Red Sox traded Wright to the St. Louis Browns, giving him a fresh start with the second division club. The Browns were helmed by Rogers Hornsby in 1952 and Wright quickly found out why the legendary second baseman was disliked by the entire team. “I opened the season hitting cleanup for Hornsby,” he recalled. “He liked me as far as hitting. If you missed a ball [in the field], you were out of the lineup. We were playing up in Chicago and I wasn't used to those double decker stands and that sun setting. They hit a fly ball behind third base that he might have been able to catch. I called him off, pulled my glasses down and ran into the shade. When I did, everything went black. He pulled me out of the lineup. Wright went from the Browns to the Chicago White Sox where he spent part of 1952 and the entire 1953 season in a reserve role. The White Sox shipped him to the Washington Senators in 1954, which was his last full season in the majors. He played nine games in the majors between 1955 and 1956, with the last two coming as a favor from Clark Griffith that didn’t sit well with his manager Chuck Dressen. Those final two games in 1956 proved to be a tremendous help for Wright later on in life. Those 28 days of service qualified him for a major league pension which gave him added security during his post-playing days. Wright played one more season with the Birmingham Barons in 1957, and that was only after some serious negotiation with his parent club. His old flying miseries from World War II caught up with him and the air travel became too much to bear. After baseball, Wright went into the clothing business, making polyester until he retired in 1982. He stepped away from the game, but still enjoyed the interaction with baseball fans through the letters he received in the mail. “I never had a desire to coach,” he said. “They wanted me to coach kids, but I didn't want to put up with families. I still watch some games. Normally Atlanta, Boston if I can get to see them. I'm not a great big fan, I wasn't a fan when I played. You lose a little bit of your drive [after you stop playing].